The next generation Producer V is the most powerful disc publishing system from Rimage, engineered for 24×7 performance. With industrial grade robotics, direct-to-disc printing and professional recording technologies, Producer V meets the world’s most challenging disc publishing demands for CD, DVD and Blu-ray Discs™. Choose the Producer V model that best fits your needs: 8300N includes a powerful embedded PC for all-in-one operation, or select the 8300 to connect to your own computer. Each Producer V system has filtered positive airflow, offering reliability in environments where dust or debris in the air would normally cripple sensitive robotic systems. Air for cooling is pulled into the system through a commonly available filter, driven by the system’s fan. This increases air pressure inside the system, preventing nearly all dust and dirt that would find its way inside. Air leaving the system is actively pushed out due to this air pressure, effectively restricting debris from coming in through system vents. 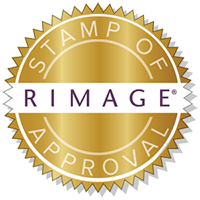 Every Rimage Producer V disc publishing system includes the Rimage Software Suite (RSS), a complete set of software unlocking the full potential of the Rimage system. The suite includes tools to submit and manage print and record jobs, create unique artwork for each disc, monitor and control system operation of one or a number of Rimage systems, and integrate into workflows to fully automate disc publishing. QuickDisc (Windows™) and DiscFlow (Mac™) allow operators to assemble and submit projects to their Rimage system. Four (4) front swappable recorders configurable for CD, DVD, or Blu-ray Disc recording. 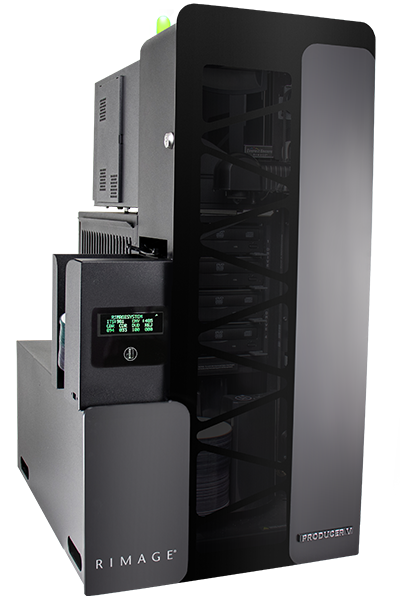 System has a 400-Disc input capacity and 100-Disc External output bin. Comes with your choice of Everest Encore or Prism III printers for full-color 600 DPI or high-speed monochrome printing. Everest Encore – Permanent, vibrant color with thermal retransfer printing. Removable retransfer and print ribbon carriages for convenience. Prism III – Fast and cost-effective direct thermal monochrome printing. Available Perfect Print technology provides registered printing on silk-screened media.